Most people don’t take the time to check their tire pressure at least once a month. Tire pressure monitoring sensors were created to alert drivers of dips in tire pressure. Does your Cadillac need new original equipment TPMS sensors? Sensors have an average battery life of 5-7 years. It is highly possible that the factory installed TPMS sensors in your Cadillac may be nearing the end. TPMSDirect offers the latest in Cadillac TPMS sensors, tools, and accessories for the following Cadillac models: CTS, Deville, DTS, Escalade, Seville, SRX, STS, XLR, and CTS-V.
We take the headache out of TPMS with excellent customer service and accurate information. Browse through our selection of OE TPMS sensors for Cadillac and find the one that’s right for your model. 1. Is the low tire pressure symbol found on the dashboard? Check for this symbol when starting the ignition. 2. Does the vehicle dashboard have a symbol of the vehicle that highlights tire positions, or a text message that states “check tire pressure” or something familiar? 3. Are the valves stems aluminum and/or secured with nuts? This may indicate a TPM sensor. 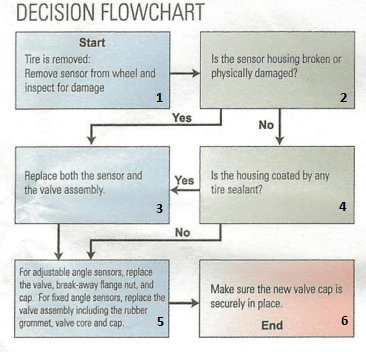 To Replace or Not to Replace TPMS? 2) Is the sensor housing broken or physically damaged? 3) Replace both the sensor and the valve assembly. 4) Is the housing coating by any tire sealant? 5) For adjustable angle sensors, replace the valve, break-away flange nut, and cap. For fixed angle sensors, replace the valve assembly including the rubber grommet, valve core, and cap. 6) Make sure the new valve cap is securely in place. END. 1) Insert the screw into the slotted hole of the sensor: Using an index finger, insert the screw into the slotted hole of the sensor housing, and check that the flats of the square part of the screw fit securely. 2) Assemble the valve to the screw: Turn the valve stem 3 to 4 full rotations. 3) Slide the valve stem through the valve hole of the rim: Hold the sensor feet against the drop center of the rim and the grommet against the seal surface. 4) Insert the nut over the valve stem: By hand or with an 11mm socket wrench begin to tighten the nut 3 to 4 rotations. 5) Continue tightening the nut: Using a Torque wrench, continue tightening the nut. 6) Valve/screw attachment is completed: The nut’s internal flange is designed to break away at approximately 20 lbf.in or 2.2 Nm. The screw and the valve stem are now secured, but the sensor is not secured. 7) Tighten the nut to the final torque: Continue to tighten the nut to the final torque (35 lbf.in or 4.0Nm). At this point, the valve/wheel attachment is completed. www.TPMSDIRECT.com – Your #1 source for OE TPMS and TPMS accessories! methods use pressure sensors to measure pressure in each of the four tires. Then these sensors transmit the pressure data via a wireless RF transmitter to a central receiver. The receiver communicates to a display that informs the driver which tire is underinflated. The tag in each wheel is designed to send a warning signal when a tire’s pressure drops below its specified safety level. 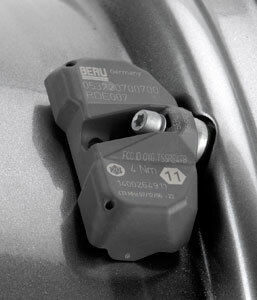 Tire-mounted pressure sensor is shown in Figure 1. Under-inflation has been cited as a cause of tire failures such as tread separation or tire blowouts. It is also responsible for shortening tire life and reducing fuel economy. Indirect systems employ wheel speed sensors on a vehicle’s anti-lock brake (ABS) system to track each tire’s rotation. The premise is that under-inflated tires have a smaller radius, resulting in a higher rotational speed compared with a fully inflated tire. The sensor is supposed to detect the faster rotation, and the system alerts the driver. In practice, this change in radius is small, making indirect measurement less reliable than direct pressure measurement. 1: Check tire pressure at least once a month and before going on long trips. Since temperature affects tire pressure, it is best to check tires when they are cold, i.e. haven’t been driven on for at least three hours. 2: Fill your tires with the pressure recommended on the tire label, located on the drivers door frame, sill or edge. 3: If you have any questions about your tires or maintenance, check your owners manual or consult your dealer. A: Keeping your tires at the recommended pressure is essential for the safe and efficient operation of your vehicle. Safety experts estimate that 25 percent of automobiles are running on tires with lower than recommended pressure. Properly inflated tires run cooler, last longer, and improve fuel economy. A: Many factors affect tire pressure, and that is why it is so important to check your tires at least once a month and before going on long trips. Tire pressure can decrease due to tire damage, slow leaks, or changes in outside temperature. For example, when the weather changes, your tire pressure changes too. For every drop of 10 degrees Fahrenheit in temperature, your tires lose 1 psi. Tires also deflate naturally over time, as much as 1.5 psi per month. A: Sophisticated sensors in the automobile continuously monitor tire pressure, and the warning light goes on when a tire is 25 percent or more below the appropriate tire pressure. A: The U.S. government, through the National Highway Traffic Safety Administration (NHTSA), requires Tire Pressure Monitoring Systems on all passenger cars and light trucks by the 2008 vehicle model year. Check your owners manual to see if your vehicle is equipped with a Tire Pressure Monitoring System. Many models have already been equipped with a system. A: On cold mornings, the warning light may illuminate and then extinguish as tire pressure increases due to driving or outside air temperature increases. Additionally, if the warning light goes on and off, a malfunction in the system is indicated by a blinking light (for a period of 60 seconds to 90 seconds). After blinking for the brief time, the warning light can remain on. You should then contact your dealer for a system inspection. A: Please heed the warning light and check your tires as soon as possible. A: The warning light may indicate a system malfunction requiring a dealers attention. If the warning light flashes before it is continuously on, but the tire pressure is found to be within the appropriate range, contact your dealer for a system inspection. A: The Tire Pressure Monitoring System is a tool to keep you informed about low tire pressure, but it is no substitute for regular tire maintenance. Check your tire pressure at least once a month and before going on long trips. Consult your owners manual on replacing a tire or using a spare tire.